Crop yields are easily overestimated when dry weather hits in July. The kernel count is there, but without rain the corn doesn’t fill. Above average rains fell in June across Missouri. That was followed by dry weather in July. Spotty rains left some areas with less than an inch of water. A strong start led to vigorous growth with lots of leaves. Pat Guinan, MU Extension climatologist, gave hope. Wednesday night and Thursday, thunderstorms developing in Nebraska are expected to move southeast across Missouri. Rains of 1.5 to 3 inches are forecast. “Don’t shut off the irrigation,” Myers said. By this time of year, all kernels will be in place, but they won’t increase in size without water. It is kernel count and then kernel size that determine yields. Size is still in doubt. Mid-August temperature forecasts are moderate, not above normal. Wiebold noted that even in cool weather, there is evaporation. “It just takes longer to empty the bank account,” he said. “Double-crop soybean fields have been hammered,” Wiebold said. 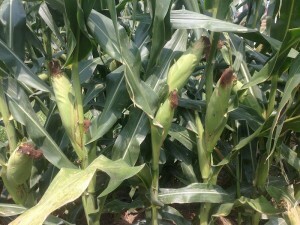 Myers said studies of corn development show lots of variation late in the season. Rain after dough stage can add a lot to dry matter. Wiebold said soybean-yield formulas are almost worthless. “There are so many ways to make a mistake in soybean estimates.” The best clue on lower yield is if you see leaves dying, he said.